You are here: Home » Historical New Zealand » Nay to Marist Horses? Actually, Colin lifted this idea and much more from the regulations of the Society of Jesus. It appears first in N.122 of his draft of 1842. It still made sense against the luxury of riding as a sport in the last century, when travel in Europe was normally no problem for the ministry as transport by coach, rail or river-boat was much easier than in Oceania where Marists settled in 1838 and in the U.S.A. where the Society of Mary grew after 1860. 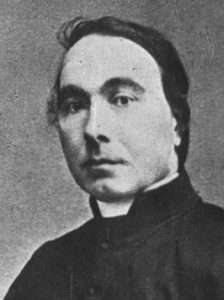 In 1842 the Marist General Chapter sent Venerable Fr Colin to Rome to gain approval for an Order with three branches. He spent the whole summer there. He came across the Jesuit ‘Institution’ and borrowed much useful material from it. He had always thought of a Society on the model of the Society of Jesus with the same aims, activities and tight structure, but with a continuing Marian outlook, spirit and inspiration. The ‘horse’ appears in N. 214 of the Jesuit document; "there was to be normally no beast of burden for riding for the use of any Jesuit" and it appears in the Marist draft also. A Vatican consultor examined it. He was a Jesuit who with a smile, told Colin that he could hardly disapprove of a Rule so full of Ignatian texts but it would not find favour with its three-branched plan from Cardinal Castracane, then head of the ‘Bishops and Regulars’. The Holy See would want each branch to be autonomous; the Cardinal later echoed this, saying "such a union would not work." The upshot was that Jean-Claude Colin withdrew gracefully for further experimentation. When the Ven. 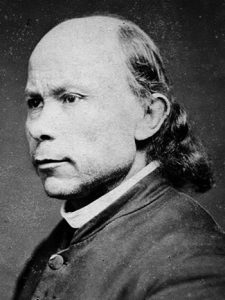 J. C. Colin was 64 years old and in frail health, though he lived to be 85, he secured his release from the post of General. In 1854 the Chapter wished him to devote himself to a Eucharistic venture, that eventually came to nothing, and to complete the Constitutions for the Sisters and the Fathers. The new General, Fr Julian Favre, was energetic in sending recruits out to Oceania to fill gaps left since Bishops such as Pompallier and Bataillon had refused to accept more Marists from Colin. On his own initiative, Favre composed a provisional rule that Rome accepted on trial, though Marists did not much favour it, for they had been trained on the manuscript copies of Colin's 1842 draft. (The Favre printed Rules said nothing about the ‘horse’.) 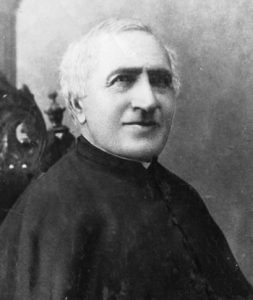 When the trial period ended in 1866, the Marist Chapter and Fr Favre himself pleaded with the Venerable Founder to complete a final version of his Constitutions. He did so and the delegates at the 1870 Chapter unanimously agreed to submit it to Rome. When the upsets of the Franco-Prussian War were over, the Holy See approved the Constitutions of the Fathers and Coadjutor Brothers of the Society of Mary (Feb. 28, 1873). This version still contained the relatively unimportant prohibition of the ‘horse’ as a luxury item. It remained until 1961 when it was quietly deleted with Rome's blessing. It certainly never upset the mission work of Marists in New Zealand. 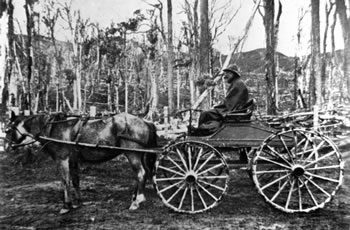 First Marist horseman, Fr J.B. Comte on the Kapiti Coast, was probably the first priest here to have a horse. He was a diocesan priest when he joined the Society of Mary. He reached the Bay of Islands in December, 1839. He worked first in the Far North, then at Akaroa; then, on the eastern Bay of Plenty from which he went on foot and by canoe to make converts at Rotorua and Lake Taupo. Next, Bishop Pompallier put him in Wellington to reside with the Capuchin, Fr J.J.P O'Reily who then boarded with the Thomas Kennedy's in Cuba Street. Fr Comte had charge of Māori work from Wanganui south and the spiritual care of the French at Akaroa. He began at Otaki and thereabouts. During the first three months of the next year - Fr O'Reily's new house at Mount Street was by then completed - he took a Māori group around the missions that he knew. They went up river to Taupo and around the Bay of Plenty and down to Hawkes Bay and back to Kāpiti area from the Wairarapa. His permanent hut and the reed church on Pukekaraka date from mid-1844. Of course, missionaries like the first settlers and their families and the Māori, walked everywhere when they could not go by water. They took the Māori tracks that are the lines of our main highways, except that they generally go by the most direct line and keep along the ridges. When a cliff face came up, the walkers would scale it with supplejacks or rope lines and carved out steps. As more people came to own horses, always costly to buy, equip and to house, bridle tracks were cut out that eventually widened to allow for carts. By the time Comte had become established at Otaki in late 1845, he had gathered several groups that came to about 200 Catholics along the Coast. Pukekaraka became a thriving centre with wheat fields, at least one flour mill, a road and a yoke of four oxen, a schooner, the Elizabeth, to ship produce around to help feed the Port Nicholson (Wellington) people. 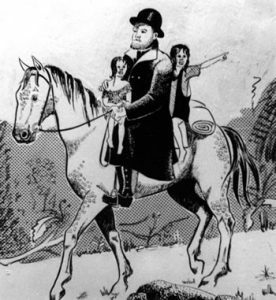 The priest bought a horse for his ministry to the north as far as the town of Wanganui. A new road joined Johnsonville to Otaki, made by British troops and government-paid Māori tribal groups. His English was good and Fr O'Reily used him in town when he went across Cook Strait to Nelson. After about ten years and many vexations, Comte moved back to town in May 1854. His concern was caused by his close involvement with the materially successful schemes he had to administer. Bishop Viard released him from his vows and he hoped to return to his old diocese as soon as funds were available. (He did leave New Zealand eventually in December.) 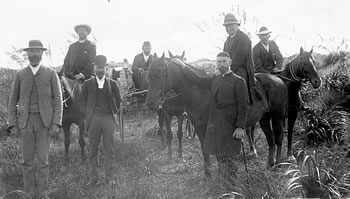 Before he left Otaki, he sold his horse, though this had nothing to do with any rule of the Order as the ‘horse’ comes formally in the Rule only in 1873. Other Catholic missionaries had not the funds or facilities for horses, even where there were bridle paths. Fr A. Garin may have had a horse at Howick before 1850, like Mr V. Lush the Anglican Vicar after then. Fr J.A.J. Seon, who then ministered at Otahuhu and Onehunga, used to walk from Wyndham Street, across to Parnell and down Manakau Road. He did this to be like Our Lord who walked. Much later on, he used to regret not having a horse when as pastor at Upper Hutt, he was too late to reach a dying person at Featherston over the Rimutaka Track. However, when Fr V. Poupinel, senior Marist for Oceania, was here and Seon escorted him to Wanganui by the beach road from Otaki, where they saw the timber stacked for the plank church, the oldest still in use in N.Z. 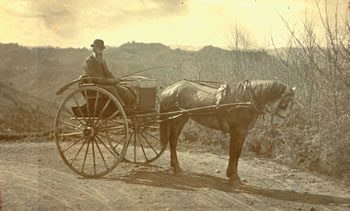 that was completed in 1859, they travelled with only one horse, riding and walking alternately, the rider tethering it and walking on to be caught up. The Marist Constitutions, obligatory after 1873, never prevented later priests from using horses in their ministry. Only Bishop Pompallier, said to have been a cavalry officer, would seem to have ridden in France. 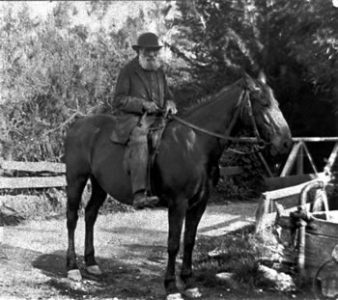 Of the many Marists who did use horses after 1850, the best known was Fr Antoine Garin, who rode all over his vast parish from Collingwood to Kaikoura. Fr Eugene Reignier in Hawkes Bay often rode across to Taupo to visit converts of his former station of Rotorua; also, to Wairoa and Mahia, and all over the new sheep stations in Central Hawkes Bay. 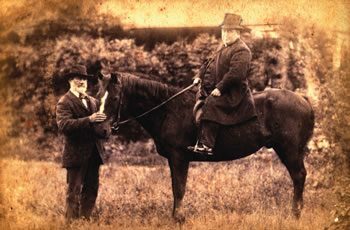 His horse, ‘Bob’, he had bought, then aged seven, in 1857, and he noted it with affection as still alive "aged 34." The Mission Farm at Meeanee, under Brother John Francon, raised farm horses, as the Napier advertisements of sires testified. (‘Desert Gold’ was trained at Otatara nearby.) Reignier financed the Providence of Napier (now St Joseph's Māori Girls' College) in 1867. There are several memoirs of him bringing girls down from rural pā on ‘Bob’ to Napier. Fr J.B. Colomb was drowned from his horse crossing Nelson Creek in the Grey Valley in 1871. He had been a rider earlier in England when parish priest at Romford, near London. After weather had undermined his grave, his body was found almost incorrupt. This was in Greymouth. 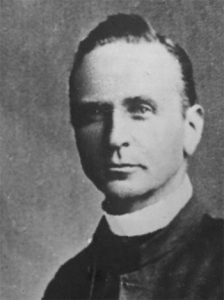 Fr N. Binsfeld, then at Greymouth, had learnt to ride in his native Luxemburg. Later on, he records how, when pastor of Rangiora, he was crossing the flooded Ashley with an altar boy clinging behind him. The boy was being swept away and the priest called out, "Grab the tail." The boy did so and was saved. He became the father of Bishop E. Joyce and Fr J N Joyce, S.M. Binsfeld had worked as a Marist in the U.S.A., as had Fr John Goutenoire who was one of the Marist ‘trouble-shooters’ then. 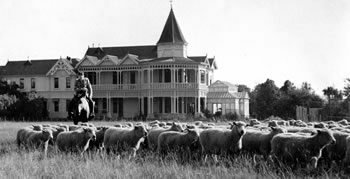 (He went to the Meeanee Seminary as the second rector and bought the Greenmeadows property after the 1897 flood.) He spent a year at Ahaura where he cleared the debts incurred by Fr E Pertuis, the unbusinesslike Māori missioner from the Wanganui River and Taranaki who had founded a boarding school in his Grey River parish. Fr Rolland eventually began the ‘Monastery’ at Koru near New Plymouth for discharged soldiers and a boys' boarding school that was not successful, despite the support from Westland miners. Later, he was appointed to the Grey River parish. He rode everywhere on ‘Butcher Boy’. His boarding school for boys and girls at Ahaura was most successful until it was closed down only when St Patrick's College was about to open in Wellington. Rolland next took over Reefton Parish. Once he is said to have ridden the same horse up to the ship across Cook Strait and then up to New Plymouth. This would likely have been his last mount, ‘Castlemaine’, that was led in Rolland's funeral cortege at Reefton in 1903, with the priest's riding boots reversed, military style, in the stirrups. 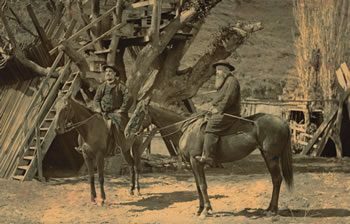 All the French Marists who came here after 1879 after the first of the new wave - Fr C. Soulas - became good horsemen, except for Fr C. Cognet who was never good with horses. This group of priests included Fr A. Sauzeau of Marlborough with his horse, ‘Barney’. The twenty-eight Irish Marists who began here up to 1900, starting with Michael Cummins in 1870, fitted in immediately and easily both as riders and drivers, as did all the New Zealanders who became Māori missioners after Fr Augustine Venning at the end of World War I.